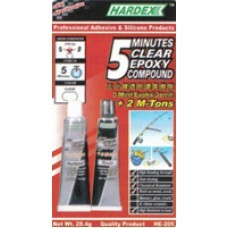 5 Minutes Clear Epoxy Compound Hardex 5 Minutes Clear Epoxy is a two component, non sag, colorless epoxy which cures rapidly to a high hardness adhesive with excellent adhesion to varieties of materials. Ideal for application to wood, metal. fiberglass, ceramic, glass and other hard plastics. Specially designed to bond and repair a wide range of substances.